To up the competitive edge for 2016, NMS South is taking on co-driver, Jason for the Miata. To help this partnership and sharing information and developing the car together this year, I've decided to run in the "pro" class with SCR-SCCA. This will let Jason and I run the car in the same run groups to better share data, tools, and driving tips to give ourselves the maxium competitive edge. The trick with Pro class is that, like the national championship only the first 3 runs count. The first SCR-SCCA event of the year was off to a rough start with Jason recovering from the flu and the Miata still under the weather as well. The good thing about Pro class is you can run a different car in a different class every event if you wanted and you can still earn points toward the season championship towards a single class. I took the Fiesta out to see if I could bank a few points and sure enough came home with a mid-pack 6th place out of 12 drivers, good for 3 season points. 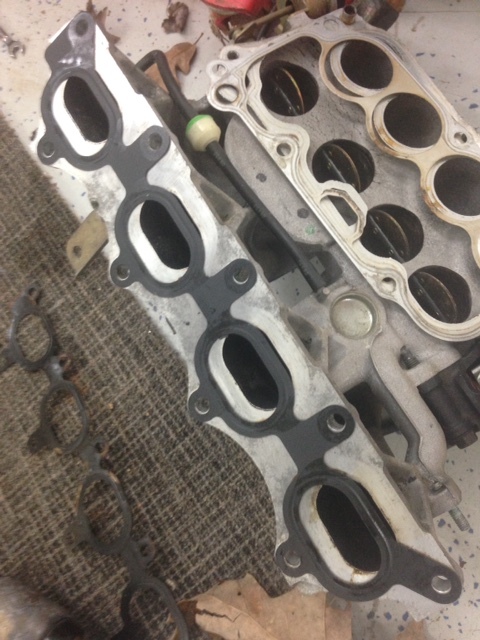 New gasket versus old. You can see they don't quite line up. With Jason's assitance, we ran through a checklist of possible issues with the Miata yesterday and tracked down what we believe is the reason it hasn't been running correctly. A $10 gasket for the earlier 1.8L engines made it's way into the kit for my newer 1.8L engine and we failed to realize it didn't fit correctly at 1am when we were wrapping up the engine build. A new one is on the way and we are hopeful for a showing at Hutchinson Island on Sunday, February 28th for the Miata's first test run of 2016! You can see how this incorrect gasket both blocks air flow and also lets some escape around the one side of it instead of completely sealing it in. The holes for the bolts/studs still line up despite the incorrect alignment with the oval ports. NMS Announces The Return of Number 77! Old Dominion Region SCCA Autocross 2016 Schedule! 2016 Superbowl Car Ads: Winners and Losers! 99 Miata - We'll Call Him "Murphy"
Slowest Kart in the East!